Classic Brands adjustable bed, apparently is the leading seller in mid and basic range adjustable beds segment. It is one of the earliest of adjustable beds and yet stood the test of time and still competes with other brands in the segment. Although, feature wise it lags behind the latest adjustable bed models but it still leads the race on customer satisfaction index, with staggering number of reviews and an outstanding rating. It's been over a year now that we first wrote this review and Classic brands adjustable bed has come a long way since then. It is now the leading seller in adjustable beds segment. There is clearly no other brand that secured thousands of reviews in adjustable beds segment. Yes, you read it right, no adjustable bed brand on the market has got more than a few hundred reviews. But Classic Brands has comfortably secured more than two thousand reviews and great customer rating. For a moment, I myself wondered looking at the sheer number of reviews it secured. It is selling like a mattress. Fully impressed. What's new from Classic Brands? Well, during the course of the year, the company has also added couple more beds to its adjustable beds segment. While Classic Brands Affordamatic is the basic version, Classic brands Comfort Posture is the high-end model. Following is a quick snapshot of its feature set followed by detailed review on each feature. The head section in Classic Brands adjustable bed can be tilted up to 65 degrees and feet section can be adjusted up to 50 degrees. While the head tilting of 65 degrees is standard like in case of most adjustable beds but what’s extra-ordinary is the feet tilting. Perhaps, there is no other adjustable bed in the market that offers 50 degrees of feet section adjustment. Although this model is not a wall hugger but there is another advanced model "Classic Brands Adjustable Comfort Posture Adjustable Bed”, that comes with wall hugger design. Durability of any adjustable bed primarily depends on the construction quality of its base. 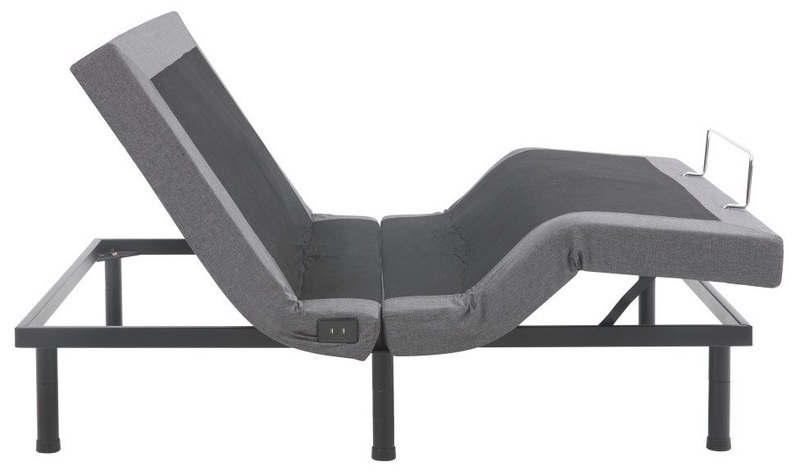 In case of Classic Brands adjustable beds, the frame is built from durable steel. While all the latest adjustable beds now in the market are now coming with 6 legs, Classic Brands was one of the very first beds that came with 6 legs while other low and mid-range beds in this range had only 4 legs. The additional 2 legs fixed in the middle determine the meticulous design that is mainly focussed for offering robust support and enhanced durability. Classic Brands adjustable bed comes with dual motors, one at head section and the other at feet section. The motors are in fact neither too loud nor too silent. They are known to be quiet while performing adjustments or massage functions. And the massage quality offered by these motors is unmatched in comparison to other beds in this segment. True to its name, Classic Brands wireless remote is sleek and carries classic look. It offers as many as 10 functions and the biggest takeaway is the visual screen making it easy to perform all functions with flashing numbers and symbols. Whereas, even the latest adjustable beds like Hofish, iDealBed and Ghostbed do not come with visual display remotes. Classic brands adjustable bed offers 4 preset positions, directly from its remote control. Zero-Gravity: In this weightlessness position, both the head and foot sections are elevated to certain height. This posture helps in enhanced blood circulation, relieves pressure off your lower back and eliminates stress from key pressure points. It also opens up air columns thereby improves breathability and results in reduced snoring. TV/PC: In this position, the head section is elevated by around 30 degrees thereby providing an appropriate head angle for viewing TV or working on your laptop. This posture eliminates pressure on your lower spine as well as neck. These key pressure points are otherwise strained as you might use double or triple pillows creating uneven gap that ultimately results in severe back pain. Lounge: The most relaxing posture with head section lifted upwards just by few degrees while the foot section remains flat. Ideal for reading books, listening to music or just relaxing your body. Flat: No matter in which position you might be in, just at the touch of a button, the bed returns to flat position. Both the head and foot sections slowly and simultaneously return to flat position without causing any inconvenience to you. In case you would want a different angle other than the angle set in preset positions, you can happily adjust the head and foot tilts. The only limitation being you cannot save these positions. Although there are no dedicated memory programmable positions but Classic Brands does offer the flexibility to program (reset) and save the above mentioned preset positions. Yes, you can adjust/reset the above mentioned Zero-gravity, TV/PC and Lounge preset positions to your desired angles and save them. 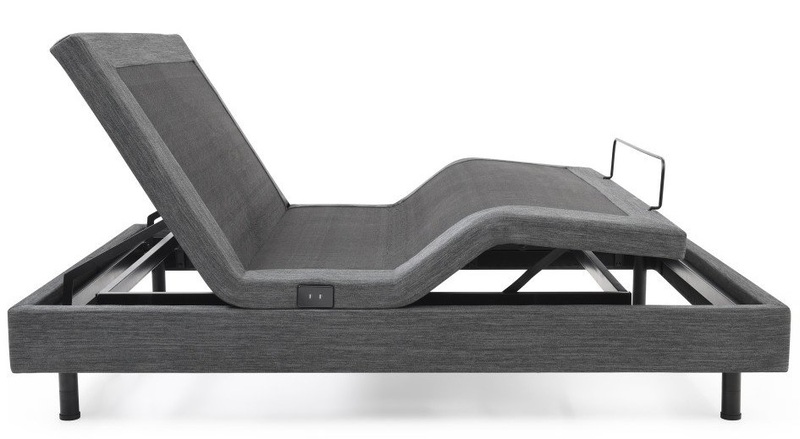 The bed offers dual massage function, with separate motors for head and foot sections. And there are 3 intensity levels to choose from – High, Medium and Low. There is again a 15 minute timer as well for massage function. Just turn on the massage, set the timer and the massage motor shuts-off automatically on reaching the set time. One of the biggest advantages in this price range is having USB ports. Yes, Classic Brands comes with 2 UBS ports. It comes with 4 inch and 6.5 inches individual units for each leg. When combined they give you a total of 10.5 inches of height above the ground. You can choose the lengths based on overall height of your mattress. Like mentioned earlier, instead of 4 legs, Classic brands bed comes with 6 legs offering more stability while performing adjustments. 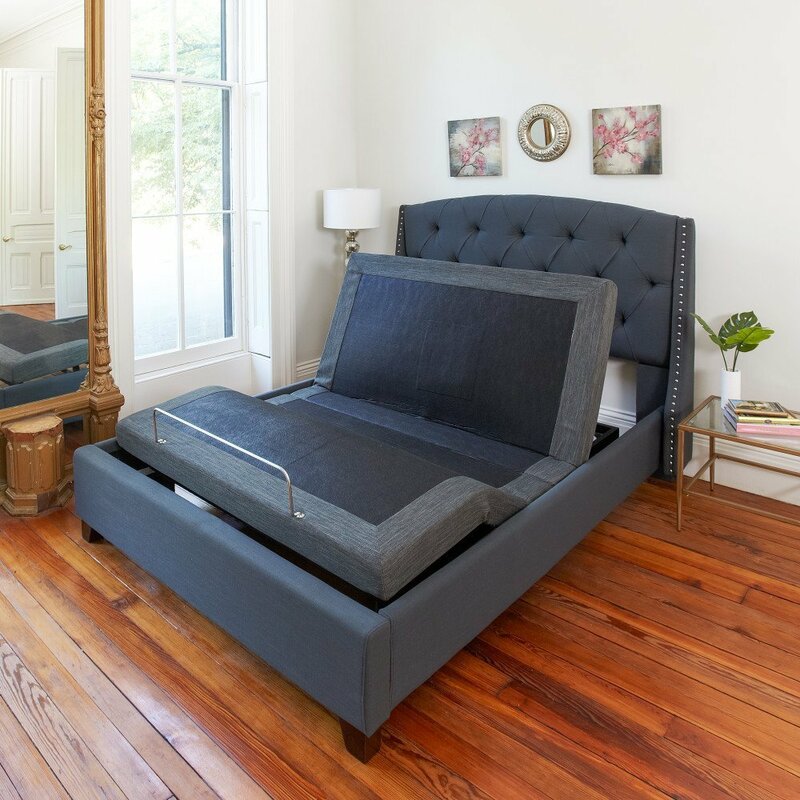 Classic brands come with a mattress retention bar at foot level. It is relatively wide enough to hold the mattress in its place while performing adjustments. If you are looking to enjoy lifestyle benefits of an adjustable bed but within the budget of a gel memory foam mattress then Classic Brands should be your preferred choice. In mid-range category, Classic brands adjustable beds’ feature set and durability factor make it the best seller. In addition to all the features in mid-range model, several more features are also added by Classic brands in its Comfort Posture+ adjustable bed. Classic brands Comfort Posture+ comes with advanced wall hugging feature. And this is the only major difference between Classic brands Adjustable Comfort (mid-range) and Classic brands Comfort Posture(advance). Rest all features remain the same in both the versions. Wall hugging is definitely a premium and nice to have feature embedded to perfection only in Leggett and Platt's Prodigy models. But they are super expensive as well. Classic brands has cleverly incorporated this feature into its Comfort Posture adjustable bed model and that too at a relatively negligible price. Hence, if you are looking for a mid-range adjustable bed but with wall hugging feature as well, then Classic brands Comfort Posture is the perfect choice, both price-wise and feature-wise. The brand new sleek looking remote control has a total of 18 functions. Instead of tuning the head and feet sections separately, the new remote now offers the flexibility to lift or lower both head and feet sections together. In place of Lounge preset position, Classic brands has embedded the very important Anti-snore position. It already offers Flat, Zero-gravity and TV/PC preset positions. While the earlier version had no memory programmable positions but the newest model has 3 memory programmable positions – M1, M2 and M3. This is perhaps the biggest of all additions alongside wall hugging features. Note: Even the zero-gravity preset position is also customizable. Tune to your favorite angles, press the zero-gravity button for few seconds to save it. Yes, torch feature is also added to the new remote control. However, nice to have feature, under-the-bed lighting is somehow not included. 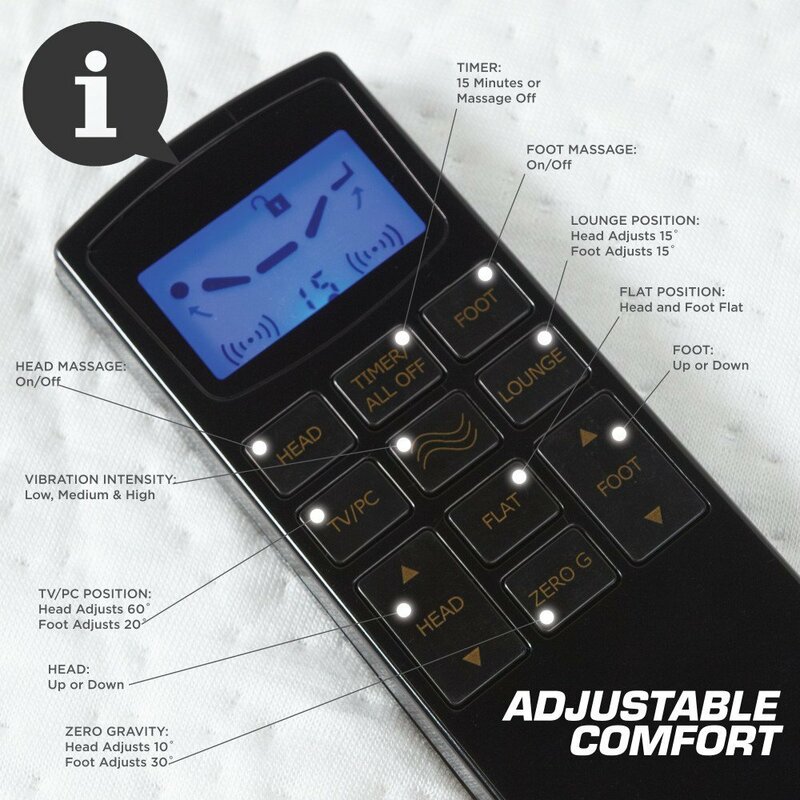 Classic brands Comfort Posture now comes with 2 massage timers – 10 mins and 20 mins. The head and feet articulations remain the same in Affordomatic model as well. The head section can be lifted up to 65 degrees and the feet section up to 50 degrees. Classic Brands Affordomatic is not a wall hugger. Classic brands has not incorporated height adjustability in this model. Affordomatic adjustable bed comes with fixed 12 inches height. With total 6 legs in place, it carries sturdy construction. It comes with the standard mattress retainer bar at the feet level. Classic brands comfort Affordomatic comes with wired remote control. It is perhaps, one of the simplest remote controls with 7 functions. 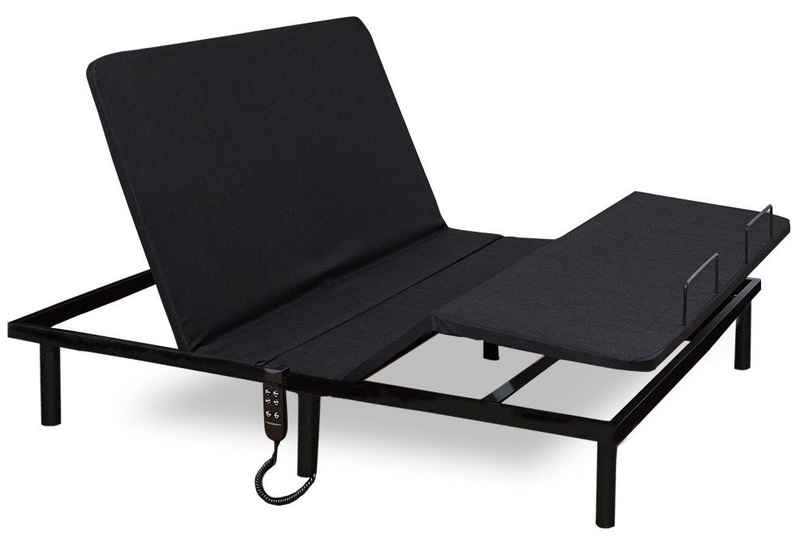 Being designed to be a simple basic adjustable bed, Classic brands has not incorporated massage functionality and USB ports in Affordomatic model.